Increasing concerns over improving the measures for automobile safety has propelled the need for advanced airbag electronics. OEMs are upgrading the electronic control units used to regulate the deployment of airbags in vehicles. Smart airbags are being integrated in the latest offerings of automakers across the globe. New technologies, such as IoT, and advanced sensors are being integrated to extend the efficiency of airbag electronics in modulating the safety of automobile and its occupants. Ongoing innovation in development of airbags has led to disruptive transformations in the technologies used for developing airbag electronics. Advancements in airbag designs are influencing the development of airbag electronics. Crash sensors, igniters, inflation equipment, weight sensors embedded in passenger seats, seat occupancy detectors and ultrasonic sensors are being integrated as key components in airbag electronics. Smart airbag technologies are being incorporated to develop airbag electronics that can instantly deploy airbags and prevent injuries in an event of collision. Transparency Market Research projects that the demand for airbag electronics will soar robustly across the globe during the forecast period, 2017-2026. According to the report, the global airbag electronics market is assessed to expand at a volume CAGR of 6.8% over the forecast period. The report further estimates that by the end of 2026, more than 237,500 thousand units of airbag electronics will be sold across the global automotive industry. Changing policies of road transport and traffic authorities with respect to automobile safety have been analyzed to study their influence on development of airbag electronics for future generations. The report estimates that airbag electronics manufactured across the globe will be predominantly used in mid-sized cars and compact cars. In 2017, nearly 60,000 thousand units of airbag electronics were installed in mid-sized cars and compact cars across the globe. Growing sales of mid-sized cars will factor their dominance in the global airbag electronics market. In terms of vehicles, mid-sized cars are expected to account for one-fourth of overall airbag electronics volumes sold in the global market. The report further reveals that compact cars will register highest volume CAGR of 8% over the forecast period. In 2018 and beyond, OEMs will be the largest sales channel in the global airbag electronics market. By the end of forecast period, nearly 57% of airbag electronics manufactured in the global market will be sold through OEMs. However, the report also reveals that the aftermarket sales of airbag electronics will register fastest growth, reflecting a volume CAGR of 7.3% over the forecast period. Autoliv (Sweden), Denso Corporation (Japan), Key Safety Systems, Inc. (US), Takata Corporation (Japan), Toyoda-Gosei Co., Ltd. (Japan), TRW Automotive Holdings Corp. (US), Ashimori, Hyundai Mobis, Ningbo Joyson Electronic, and Nihon Plast are globally observed as leaders in development of airbag electronics. These companies have been extensively profiled in the report, and their latest strategic developments have been detailed in an unbiased format. 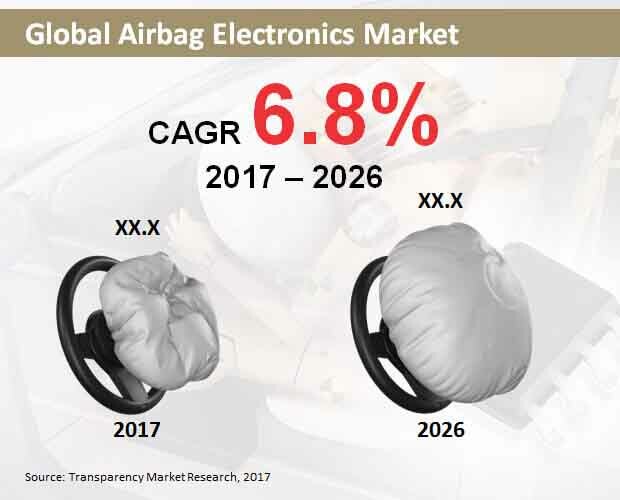 While these companies are expected to remain key stakeholders in the expansion of the global airbag electronics market through 2026, increasing manufacturing complexities and discrepancy in the global supply chain for automotive components will continue to serve as key market entry barriers. In recent years, a considerable rise in consciousness concerning safety of automobiles has driven the demand for airbag systems and their control units. Vehicles are being equipped with ample number of airbags to minimize the potentials of putting the occupants’ lives at risk. New electronic control units are being developed by OEMs, and advancements such as pre-tensioners and rapid deployment protocols are being incorporated in their development. With growing sales of automobiles recorded across the globe, the demand for airbags is expected to soar concurrently. Manufacturers of airbag electronics are shifting their traditional approach and catering to the electrical requirements of smart airbags. Advanced airbag designs, highly-integrated crash sensors, seat occupancy detectors, and deployment control units are some of the key components of airbag electronics which will continue to incur innovations in the near future. Transparency Market Research has developed an insightful forecast study on the expansion of the global market for airbag electronics for the assessment period, 2017-2026. In this study, several aspects encompassing the production and adoption of airbag electronics have been addressed and analyzed to ascertain their impact on market growth. Advancements in the integration of airbags across different types of vehicles have been studied to reveal future prospects of manufacturing airbag electronic control units. Emergence of a variety of additional sensors has been pegged to make the manufacturing of airbag electronics more complex in the near future. Furthermore, changing government policies and an upsurge in the implementation of initiatives towards promoting automobile safety are also studied to develop a roadmap of airbag electronics market expansion in this report. A suite of research methodologies has been employed to understand the growth potentials of the global airbag electronics market in both, top-down and bottom-up approach. Tested and proven methods of market size forecasting have been used to translate loads of qualitative information into quantified data. The report has been designed to provide instant preliminary information on manufacturing of airbag electronics. Graphical and tabular representations of the forecasted market size estimations facilitate an ease of analysis and helps in linking socio-economic data with the changing undercurrents of the global airbag electronics market. For comprehensively analyzing the global airbag electronics market, the report has segmented it on the basis of vehicle type, sales channel and region. The global airbag electronics market taxonomy has been illustrated below. The report also offers cross-segmental analysis on the expansion of the global airbag electronics market. Country-specific airbag electronics market have been provided in this report as well. A detailed assessment of the leading manufacturers of airbag electronics is a key highlight of this report. Key players in the global airbag electronics market have been profiled by addressing their current market standings and revealing their latest strategic developments. Inferences provided in the competition assessment are aimed at providing objective information that can influence the decision of investors and also enable the market players in deriving informed strategies towards future market direction.